Have you ever wondered why a dish from your favorite restaurant tastes so much better than when you make it yourself, or why grandma's soup always made your taste buds shout whereas yours is bland? The secret is in the seasoning! Why do you think the Colonel's chicken has been around so long and still going strong? It is the secret blend of eleven herbs and spices. That was always a treat when I was a kid. There are many more herbs and spices than we can explore here, and their uses reach around the globe and back. This is simply an overview of some of the more common ones you may have in your own kitchen and how you can use them. A herb is a plant whose leaves are used in cooking to add flavor to food, or as a medicine. Herbs may be used fresh or dried, depending on the recipe, but always use fresh in salads, salsas or as a garnish. The flavor of dried herbs is more concentrated, so when using dried herbs, use about 1/3 the amount you would use of fresh herbs. It is helpful to crush them between your fingers to release the essential oils and bring out even more flavor. Basil is a member of the mint family and has a mild liquorice flavor. It is often used in sauces, soups, salads, sandwiches, and of course, pesto. Oregano is also a member of the mint family and commonly used in spaghetti sauce, pizza and Greek cuisine. Thyme is used in French cuisine with meats such as pork, lamb, duck and goose. It pairs well with rosemary, sage, oregano and parsley. 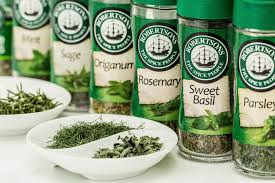 Thyme also complements spicy Italian sauces, soups and stews. Rosemary has a strong lemon-pine aroma and flavor. It pairs well with roasted lamb, garlic and olive oil as well as roasted potatoes and breads such as focaccia. Given it's strong flavor, less is more. Parsley has a mild, grassy flavor that works well with garlic and olive oil. Add anchovies and you have a wonderful sauce for grilled beef. Sage is native to the Mediterranean and has a fuzzy texture and a musty aroma. Italians pair it with veal, while the French add it to stuffings, sausages and pork dishes. This too has a strong flavor, so go lightly. Cilantro is similar to parsley in appearance but is very different in flavor and aroma. It is frequently used in salsas and Southwestern cuisine. It is a "love it or hate it" ingredient" as some people find it has a "soapy" flavor. Spices are a flavoring for food made from part of a plant, such as its fruit, seeds, or root, usually dried and often made into a powder. 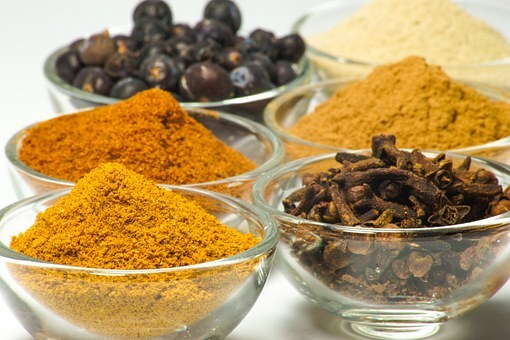 You may purchase spices whole and grate them at home with a grater or spice grinder. Chili powder is used most often in chili, both meat and vegetarian based. Curry powder is an essential ingredient in Indian and Thai cuisines, and is a blend of spices that can be sweet, or mild to very hot. Cumin has an earthy, nutty flavored and is commonly associated with Mexican and Spanish cuisine, but also frequently used in Middle Eastern and Indian cooking as well. Coriander comes from the seeds of the Cilantro plant, but with no similarity in flavor. Coriander has an earthy, lemony flavor that works well with cumin. I use these together in making black beans. Turmeric is a relative of ginger and widely used in Indian and Thai cuisines and contributes largely to the yellow color of mustard. Turmeric is also used as a natural anti-inflammatory, either through food or in capsule form. Cayenne pepper is a medium hot chile pepper which is versatile, widely used and often found at the table in pizzerias. It adds a nice burst of heat to many different cuisines. Ginger, when paired with garlic, is an integral component in Asian cuisine, specifically Chinese. Like turmeric, ginger also has many health benefits. Cinnamon is a spice that comes from the inner bark of trees from the Cinnamomum family, and there are numerous species of cinnamon. It is a sweet spice usually used in desserts, cereals and breads. Nutmeg is a warm, fragrant spice that adds something special to sweet as well as savory dishes. Try adding a little freshly ground nutmeg to greens such as spinach or in your Christmas eggnog. It is used in sweet dishes in India and savory ones in the Middle East. Cloves are the unopened bud of the clove tree which is native to India and Indonesia. Cloves lend a deep sweetness to desserts and baked goods. This pungent spice should be used sparingly so as not to overpower the dish. Now look through your pantry and see what inspires you to make some new and exciting dishes. Do you regularly cook with herbs and spices? I have basil, oregano, thyme, rosemary and sage that I use often, plus a bunch of spices and blends. Good stuff! Oh boy! This is great information. I would like to print this and post it inside my spice cupboard. I try to stay away from anything that has GMO (genetically-modified ingredients) by going organic only. Christine, you have made my day! I am so glad you found it helpful. Thank you!